> Trucker Hats - Vintage, Retro, Cool for a Limited Time Only! > Custom Writing Journals Available for a Limited Time! > Kids and Infant Wear! Visit our main anti-clown store for black t-shirts, baby dolls, stickers and more. Like offensive t-shirts? Check out the great line of t-shirts at obsinatees. Sign up for an anti-clown email address @ihateclowns.com, @clownophobia.com, @clownssuck.com. Vote for and view the scariest clown pics on the internet. Click any cool logo below to view the available products with that design. You can also view the products by type (ie: view all t-shirts, view all license plate frames) by clicking the links below. Vintage Retro Cool Trucker Hats and Caps Available for a Limited Time! Custom Writing Journals Available for a Limited Time! 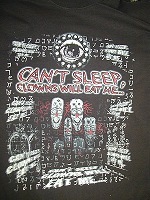 Please note that these items are processed and shipped by our fulfillment center at CafePress.com; separately from the screen printed anti-clown merchandise sold directly from our website. If you see the white banner across the top of the screen, you will know you are at our CP Store. To buy items from both places you will need to place 2 separate orders. Wholesale inquiries are welcome. If you would like any product customized with your name, screenname, nickname, etc, please let me know. Subscribe to the i hate clowns newsletter!